Illinois State alum Sean Smoot with President Barack Obama outside the White House. Sean Smoot ’91 was at home with his family, cooking dinner on a recent Sunday night, when an “Unknown Number” called his cell phone. It was the White House, asking for his help. Smoot is one of the state’s top experts in police and public safety policy, and the Obama administration was creating a task force to explore ways to improve police-community relations. That move was spurred by recent events in Ferguson, Staten Island, Cleveland, and around the country. “It was exciting but very surprising—and humbling,” said Smoot, a criminal justice sciences grad. “These are not easy things to talk about with communities, or with police officers. A lot of these conversations are not comfortable for anyone. But I think it’s very important that they happen. “So I’m extremely honored that the president thought enough of my work to include me,” he added. Smoot is one of 11 members of Obama’s Task Force on 21st Century Policing. They’ve already begun listening sessions across the U.S. and are taking public comments. Their initial report is due March 2. 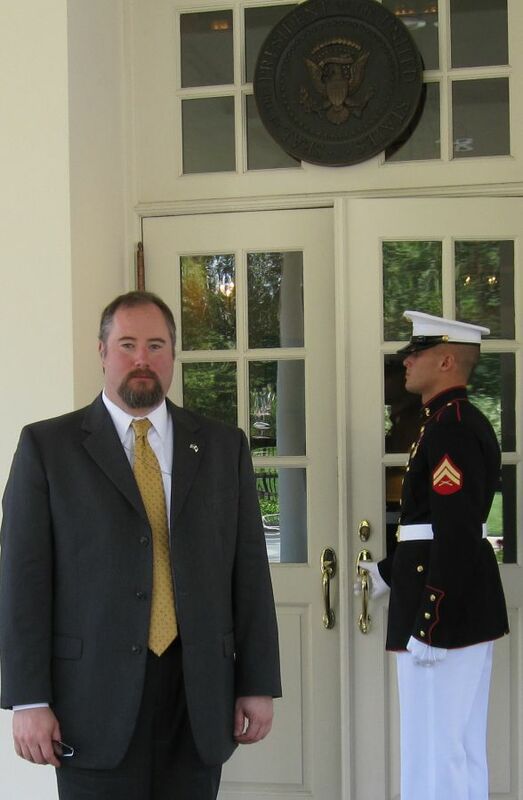 Illinois State grad Sean Smoot at the West Wing entrance at the White House. “We really want to give the president some solid, practical recommendations on ways that the police can engage more effectively with the communities they serve, and build the trust within those communities, while continuing to reduce crime,” Smoot told STATEside. It’s a huge responsibility, but one for which Smoot is ready. He’s the director and chief counsel for the Police Benevolent & Protective Association of Illinois (PB&PA) and the Police Benevolent Labor Committee (PBLC). That makes him an advocate—in Springfield and in labor negotiations—for many of Illinois’ rank-and-file police officers, including the Illinois State University Police Department. His lengthy resume includes service on countless boards and committees, as well as authorship of legislation and policy papers. He was also admitted to the U.S. Supreme Court bar. But it’s his membership in an elite group at Harvard University’s Kennedy School of Government that helped land him the task force post. That group, called the Executive Session on Policing and Public Safety, puts Smoot among the foremost leaders in public safety policy in the country. It didn’t hurt that Smoot has known Obama and Biden since the 1990s. He worked with Obama when he was a state senator in Springfield, and he worked with Biden’s office on 1994’s landmark crime bill. Smoot would later serve as a police and public safety advisor to the Obama-Biden transition team after the 2008 election, helping formulate early administration policy. Smoot, who is also a veteran, has always gravitated toward leadership positions. At Illinois State, he was president of his fraternity and was part of the Criminal Justice Association student group. And while he attended law school shortly after graduating Illinois State, Smoot credits his undergraduate education with bolstering his passion for criminal justice. It also introduced him to “community policing,” an approach to law enforcement that he’d later discuss within the Harvard group.